This entry was posted on June 17, 2015 by admin. The Dana 44 has been a desirable axle for Jeep builds nearly since its introduction in the 1940s. But before you get too excited about scoring a Postal Jeep 44 or even spend much energy drooling over the next-gen or new generation Dana 44 used under the 2007-2016 Jeep Wrangler JK, you owe it to yourself to learn the facts. Not all 44s are equal. The Dana 44 has been manufactured for nearly 70 years, and was original equipment under Jeep, Ford, GM, Dodge, International Harvester and Studebaker vehicles, and even the Isuzu Rodeo and Honda Passport. And almost every one of these had some unique, funky specification just for that model. The Dana 44 has been offered in both high- and low-pinion, with centered and offset pumpkins. Factory axleshafts ranged from 10-spline through 32 with diameters from 1.175-inch up to 1.41-inch. We hear more confusion, though, over the new-generation Dana 44 than any others. For simplicity, all older Dana 44 axles can be lumped together as first generation. The ring-gear diameter and core internal measurements didn’t change much. Changes first emerged in Dana 44s for Rubicon model TJs. These axles used a unique ring and pinion, but most other features remained the same (e.g. carriers, bearings). With the development of the Jeep JK, a new version of the Dana 44 was created which some people call a second generation, next-gen or new generation Dana 44. That’s why we put together this comparison chart that shows the difference between the most common first generation 44, the next gen 44, the MOPAR 44 offerings and our own Dynatrac ProRock 44. Notes: Last 44F fullsize straight axle: 1987 Jeep J-truck 1987, 1992 Grand Wagoneer, 1979 Ford Bronco, F150/250, GM 79/80 K10/20, Dodge 1984 Non-Disconnect, 1985/2001 w/ Disconnect only. Re-emerged in TJ 2003 Rubicon. Rare versions from non-US vehicles existed. Here’s where it gets confusing: the next generation Dana 44 uses a different sized ring gear depending on whether it is a front or rear axle. The front uses the old, 8.5-inch diameter ring gear, while the rear uses an 8.8-inch ring gear. Both the front and rear have larger diameter pinion shafts and pinion bearings with larger inside and outside diameters. The larger diameter of these components contribute to strength and stability. On the front, however, the pinion bearings are closer together compared to the first generation Dana 44. The rear has them spaced out, similar to a first gen for even greater strength. The carrier bearings are slightly larger in diameter with the new generation Dana 44 found in Rubicon models. 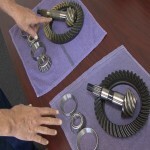 Another difference is found in the design of the differential. The cross-pin in the Rubicon next-gen 44 is not in the same place as the first gen, requiring different length axleshafts. The Rubicon model next-gen 44 front axleshafts also used larger steering joints and had more beef around the joints. The non-Rubicon JKs only came with a Dana 44 rear axle. The differential and carrier bearings in the non-Rubicon models are the same as the older generation 44s. When we engineered the Dynatrac ProRock 44 for the Jeep JK, we took into account the changes in the new generation 44 and developed an axle housing that was much stronger than stock and allows owners to swap over the Rubicon axle internals. This helps customers keep their costs down and retain the factory locker controls. Our ProRock 44 housing also accepts a conventional locker if you don’t have a Rubicon. Every ProRock 44 starts with a patented, nodular iron center that offers the best ground clearance of any 44-based axle. We equip them with our massive c-forgings and they come with either new stock balljoints or Dynatrac HD Rebuildable Balljoints and new suspension bushings already installed. Our ProRock 44 Unlimited comes with 3-inch diameter, ½-inch wall thickness axle tubes. You can learn more about what makes our ProRock 44 the best choice for your Jeep in the video below. I need a 44 badly for the rear of my YJ. The old 35 is on its last leg.